I recently wrote a novella (so the wife says) about my 5 years playing World of Warcraft trying to complete a quest I set for myself. However, there is (at least) one other thing I did forget to mention. Gameplay in the world is generally pretty predictable, except at certain times of the year when world events occur, or on the odd years when a patch is released. The first year I played was the release of Wrath of the Lich King, and the world event for Hallow’s End that year was marked by rolling hordes of zombies in all the cities, and mayhem that kept us lows (players who didn’t have characters at max level. Level 70 at that time) from getting anything done. A world event and a expansion pack release event rolled together, or so it felt at the time. I remember walking one of my ‘toons into Ironforge and wondering where all the guards were, why was there smoke in the air…? Suddenly, in the distance, movement in the smoke. Players? No. Zombies! Every freaking NPC for the city had been turned into zombies by players who had been infected by the undead plague. It’s funny now in retrospect, but I had things to do in the cities, unlike max level characters. I was quite annoyed at the time. My toons took to sleeping in trees outside the cities until the the patch event had passed. However, the first world event that took place in World of Warcraft after my subscription started was Brewfest; and Brewfest has remained my favorite event in the game ever since. When it spawned outside of Orgrimmar & Ironforge, I had no idea it was a temporary thing, or that this same event (like many others) would re-occur annually. I feel in love with it. There was a Jackalope over the bar in the local beer hall in the Kansas town I grew up in. My dad used to love to tell stories about hunting Jackalopes; to which all his friends (who were in on the joke) would lovingly add details. I can’t speak for the other children, but I was fascinated by this cryptozoological problem. I would go looking for Jackalopes while wandering the fields near my house. Unsurprisingly I never did find one; not until I started playing around at Brewfest. The purpose of Brewfest was to get your character blind drunk; or rather, the program responded (and still does, to some extent) to each beer you drank by making the screen images progressively fuzzier, distorting perspectives into tunnel vision. Also, after you’ve drank about three strong drinks, invisible creatures started to appear. Little horned rabbits with wings. At first I thought I was seeing things. I really did feel like I was drunk (still do, sometimes. I blame the Meniere’s) and where did those creatures come from? They were labeled Wild Wolpertinger in the game. Researching the name, I discovered that Jackalopes and Wolpertingers are related; related by beer. Wolpertingers are commonly found on display in taverns in the Bavarian region of Germany; and Jackalopes seem to be found in German settled areas of the American Southwest, also to be found in taverns there. I had discovered a long drinking tradition, the telling of tall tales while indulging in the spirits at the local drinking hole. My father, whose mother was of German descent, was simply carrying on the tradition. The first year I played, you couldn’t catch Wild Wolpertingers, but you could purchase a pet one with tickets (and your pet is invisible to everyone but you. Unless they are drunk) You can catch them now, just like you could when the event first started, but that year you couldn’t. I had to have one, so Tharthurm and I spent some quality hours working at Brewfest to get tickets for the Wolpertinger. Even took some tourist shots with the local guardsmen. It was the event of Brewfest, combined with this whole new world to explore, that made me fall in love with the game. 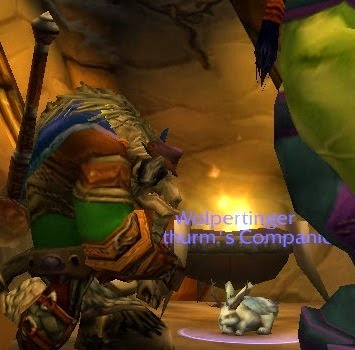 It was after getting the pet (the pet that no one can see but me) and having it summoned pretty consistently for months, that I began to identify with the Wolpertinger; after all, it and I were the only consistent things across the various characters I played, and the other players couldn’t see either of us. So I started using it as my avatar across many boards and platforms I post in, using the cryptozoological beast to represent me. I commissioned a piece of art from an artist I know so that I wouldn’t have to violate Blizzard’s copyright to it’s own game images. Hers looks better than theirs, anyway. That is where I am today. Represented on the internet by a cryptid that my dad used to tell great stories about, and that I rediscovered in a game I just happened to be playing because a friend asked for a favor. 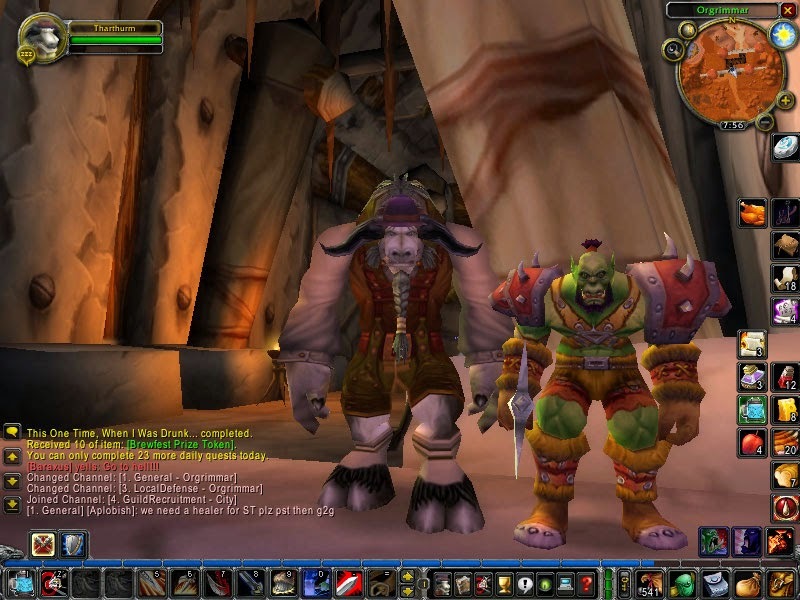 If you play WoW and haven’t taken time to get your What a Long, Strange Trip It’s Been achievement, You are missing out on one of the more interesting parts of the game. You should at least try Ram Racing. 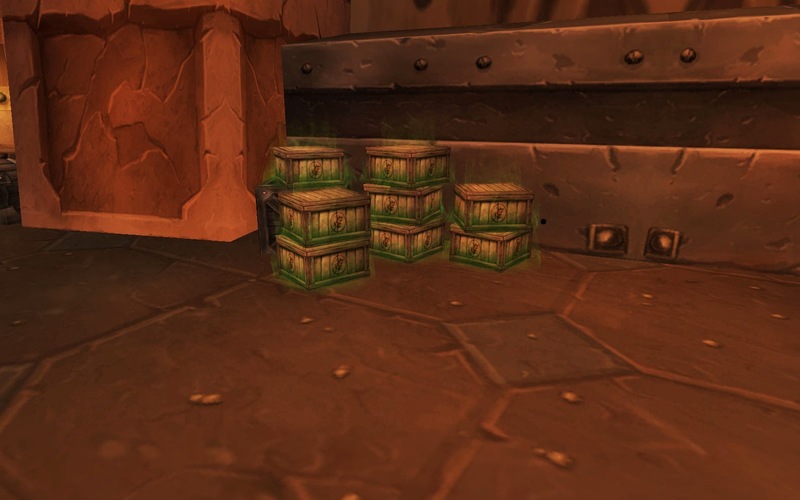 Do it now, because Brewfest is here! First the praise, now the criticism. Three years ago the designers at Blizzard got lazy and they gave up offering new mugs (the in-game collectable for this event) and at the same time disabled a handy feature of the game for new players. The old mugs were a useable item, and gave a buff which was useful in game. Rather than scale the buff for new releases of the game, they simply replaced the real mugs with a magically refilling baby bottle that does nothing. Bring back the mugs! Bring back the buffs! (this is true of Hallow’s End candy as well) Update the gear drops for mid-xp and end of xp events, for crying out loud! Make it desirable to do the events, so that people will do them. The toons don’t get blind drunk killing Dark Irons anymore. I get it, we want to be sensitive to people who don’t approve of drinking to excess, but it’s a game for crying out loud. I still go around killing everything that moves in the game, and I don’t feel the urge to do that in real life. I also understand that players become ill watching the drunken graphics. Me too. It would be nice to be able to just kill the visual effect with an easily findable toggle when it gets to be too much. But that is aside from the point of drinking beer and throwing mugs to down the Dark Irons. What are we saving the kegs for anyway since they can’t be used to refill mugs? See the first critique. Finally, let’s admit the game has changed. Pandaren should be top brewers, not Ogres. Ogres make some nasty strong drinks, but Pandaren have turned brewing into a lifestyle. They should not be relegated to a booth in the corner quietly selling also items that have no bearing on the event itself. None of my Pandaren will even go to the event until they are properly represented as the best brewers on Azeroth. Call it a protest. The rest of them will be there, though. Next Next post: World of Warcraft; New & Improved?